We rescued this beautiful cat we found languishing in the woods. She chose us for the job. We were walking the trail in a metropolitan park on a Sunday afternoon when I heard an occasional quick, quiet “mew.” At first I thought it might be the call of a catbird and I looked up into the trees. But the meows grew louder, closer, and were accompanied by a rustling in the underbrush. In short order a beautiful, solid grey adult cat emerged, wound quick figure-eights around my legs, and accepted all the petting we would dole out. It was if this cat had known us for years and was happy to see us again! From our point of view, however, it was a feeling of concern for its welfare … a stray! We were not looking for a cat, and what if she is simply on a tour of her home territory? We continued down the trail and the cat followed. When I tried to pick up the cat, obviously underweight, she would tolerate being carried only so far then, squirming, insisted on being let loose. She would not walk with us back to the car; we thought we would take her to an animal shelter. We sighed but felt we needed to leave her behind as she disappeared once more into the underbrush. We wished the best for her. Our thoughts stayed on the cat during the next day. I reported the cat to a community rescue organization and the animal warden walked the same path we had. No cat was seen or heard. “Were you thinking to go back and check the park,” asked She Who Must Be Obeyed. “Yes.” We returned that evening, after work, this time with a pet carrier, looking for our lost friend. We watched, listened, and carried on light conversation so that any nearby cat would hear us. We were just about to leave, presuming the cat had moved on, when I paused near the final turn in the path to the parking lot. I heard those little mews again. Kitty again emerged from hiding, responded to calls of “here kitty” from She Who Must Be Obeyed, was picked up, and was placed into our pet carrier. Easy as could be! The cat, we had temporarily named for the park in which she was found, was way too trusting and healthy to be feral, way too scrawny to be simply patrolling. We suspect this kitty was abandoned in the park, unwanted and uncared for. I’d been in touch with a local animal shelter but, when we arrived, we were told the shelter was full and that there was a waiting list. We called another shelter and got the same answer. Every other place else was closed. So we took her to the very helpful Metropolitan Veterinary Hospital, Akron, where she was admitted (after some begging from me) for rehydration and a solid meal. The cat traveled almost silently in the pet carrier, surprising us since our own Tasha yowls during entire short trips. She weighed a mere seven pounds, possibly two pounds underweight. It was late when we finished at the hospital and we were tired. Our cat was apparently exhausted. The following morning I took her to our regular vet for continuing care: shots, deworming, testing for nasty feline diseases. We were making sure she would be in prime condition for adoption. I took the day off to try and work the problem of what to do. We were able to board her with our vet for a bit while we sought placement with a no-kill shelter or associated foster home. Really nice digs, for a cage: like four times as big as a regular enclosure and all to herself! She got the usual course of vaccinations over the next couple of days and received flea treatment afternoon, just in case! 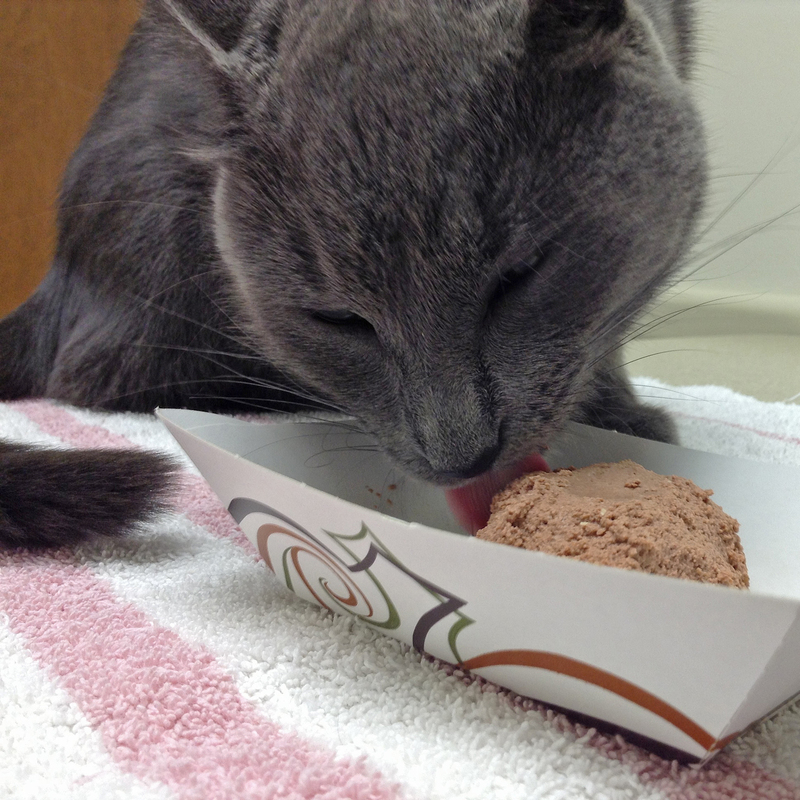 Before a tussle over blood collection, kitty was offered food and found it delicious (pictured below). Safely ensconced with the vet, we considered the cat’s situation: We feared adopting her into home because of our resident cat’s intolerance for others of her kind. Having seen the overcrowded conditions at the shelter, I didn’t feel comfortable with that but there was no room anyway. Checking with other animal rescue and adoption agencies in our area we found the same sad situation everywhere: no room for any more cats or kittens! Local animal control agencies had no reports of a lost cat matching this one. We didn’t rescue this cat only to cage her forever or have her put down. What to do? We did the only thing we could do with clean conscience and aching hearts… we decided to adopt her. Now known as Annie, the cat spent a few more days with our vet. We had requested spaying but it was found she had been spayed — markings indicated the procedure was most likely done through the auspices of a rescue shelter! While being prepped for the surgery she did not get, Dr. A examined Annie’s teeth: several were in very bad condition. While the cat was asleep, four teeth were removed. All tests and health exams came back “clean” for this stray/abandoned sweetheart, now believed to be about three years old. 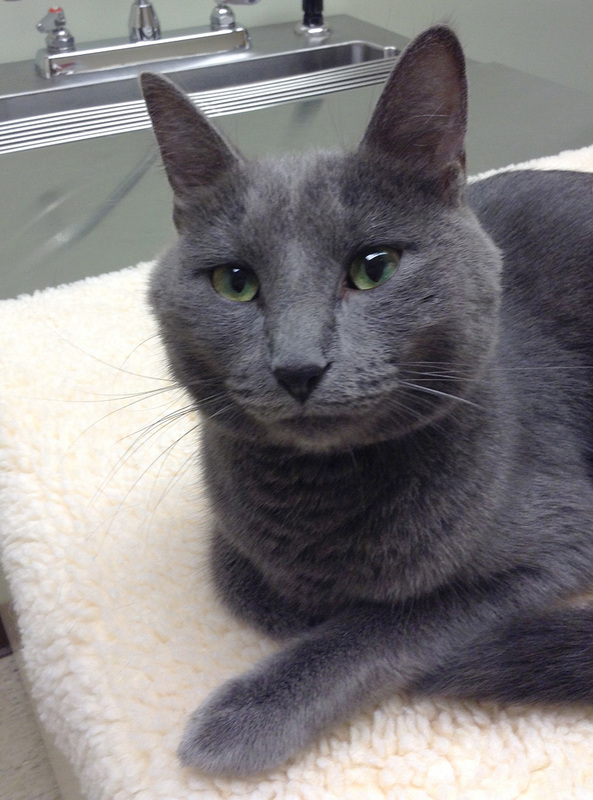 We are working to introduce this loving and energetic cat into our household. First confined to one small bedroom, now spending her days in the master bedroom with evening releases into the rest of the house; soon to be exposed, while confined in a sturdy carrier, to our resident senior cat, Tasha. This is going to be tough! In the mean time, Annie continues to settle in. Loves to watch birds from bedroom windows, eats as much as we will feed her (wet food now, while the mouth heals), and astonishes us with her feats of feline agility — she is longer and taller than our Tasha, and about 10 years younger. Watching from the woods as other people walked past, she chose us. We don’t know how she picked us, but Annie made the choice. We were not looking for another cat, and had reservations about taking on another lifelong charge. We didn’t do the “smart” thing but did the only thing our hearts would allow: we took her in. What a touching story! 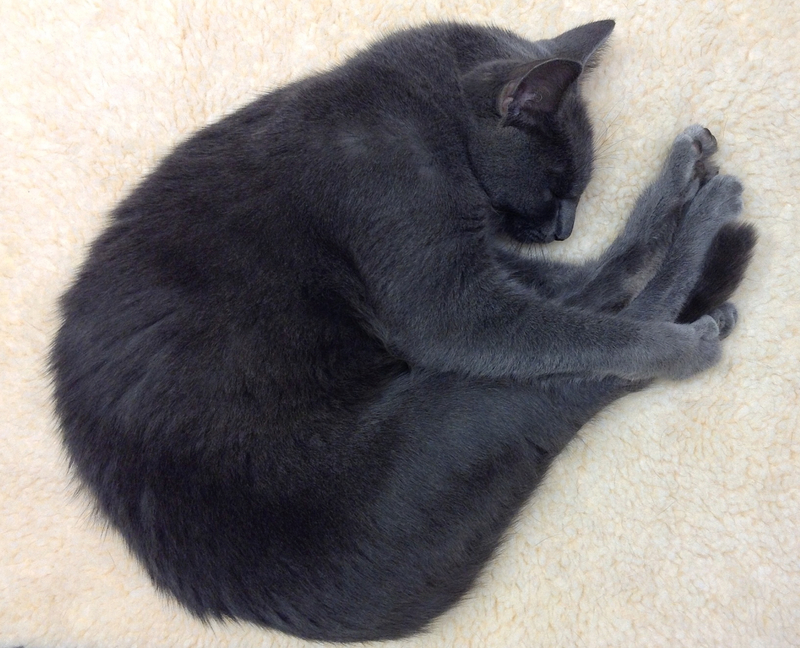 I love the picture of Annie’s front paws holding her back paws…Cats make the best positions! I am sure you will get LOTS of good pics with this special creature. Thanks, Kim. That “fetal position” or “kitty diving” pose is my favorite. So far only iPod photos because, “the best camera is the one you have with you.” I hope soon to get some better shots of this statuesque beauty that graces our home! Thanks. She’s a beauty, alright, starting to learn her place in our home. What a great story James! She has an intelligent little face and she has chosen her new family well. It’s a shame she was not micro-chipped so that if anyone was missing her they could be reunited. Annie is very smart and very energetic! 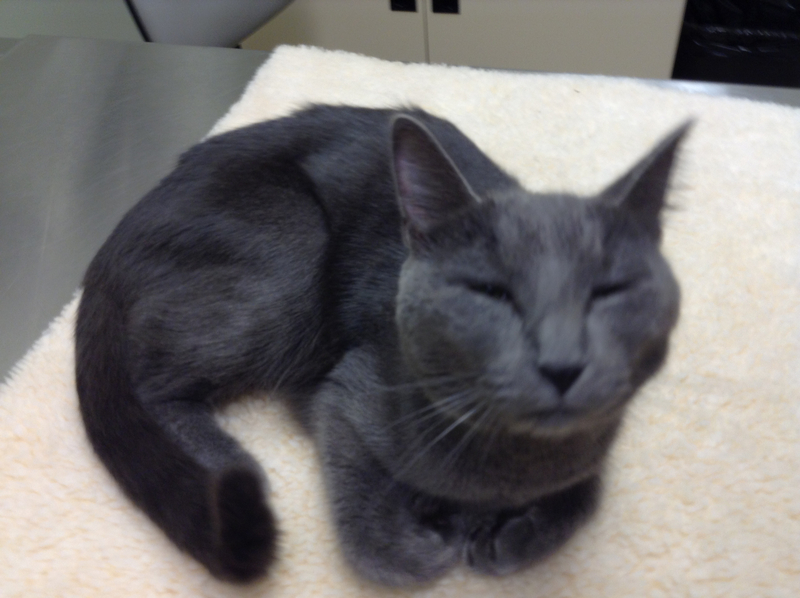 We’re delighted to have her but resident cat Tasha is not pleased… not pleased at all! She looks so much like our “Nigel” in the sleeping picture. In “face-on” pic she looks like she has some bobcat in her genes. Glad you took her in. I am missing (just a little) not having our cats any longer. Yes, Annie has a very interesting look, both exotic and wild. I love the long lines, like an Abyssinian, and her eyes are a beautiful combination of yellow and green. So energetic, she loves to chase around and occasionally ambushes me; we haven’t had that sort of cat behavior in our house in many years. We thought resident cat Tasha would be our final house cat but, well, it didn’t work out that way!